Boris Feldman's makeshift cubicle hugged a dark, windowless wall. On one side of his cube hung several dozen dress samples from various vendors, dresses that would never appear in the catalog. Empty cardboard boxes were stacked on the other side of his cubicle. The surroundings may appear dingy. The actual cube of this CRM Manager, however, appeared almost futuristic. A modern workstation, a 23" flat panel monitor, and a one terabyte external hard drive sat on top of the synthetic surface. "I bought the equipment myself!" proclaimed Mr. Feldman. "Yeah, I had to buy all of this myself, $4,000 out-of-pocket. Finance wouldn't give me what I thought I needed to do my job, so I took matters into my own hands. Those merchants jet off to Milan twice a year while sitting in first class, but I cannot get the hardware I need to do my job. Then old man Glieber cuts my salary by ten percent this year, citing the 'unprecedented economic crisis' as the reason. Nice. And after I buy all of this stuff, the Information Technology team refused to hook me up to the company network, suggesting that I could bring in a virus that would cripple the company-wide computing system." I was curious how he imported and managed data. "I created my own data mart from the corporate data warehouse. I went down the path of submitting SRs (service requests) to Information Technology to modify the corporate data warehouse. They prioritized my requests for completion some time in 2012. Doesn't they Mayan calendar say the world is coming to an end in 2012? Each Monday, I download an extract from the corporate data warehouse, burn it onto a DVD, import the data on to my own workstation, and then I create my own customer information tables on my workstation. I do all of this using SQL, an old college version of SPSS, Microsoft Access, and that neat statistical language called 'R'. Now I'm trying to figure out how to merge web analytics data to my data mart. I think I can embed e-mail address in the cookie for our registered users, and then link all the web analytics data to my mart. Oh, once I get that done, look out!" "Hey, I have a secret analysis that I did earlier this year, do you want to see it?". Mr. Feldman pulled out a slide from a Powerpoint presentation. "What the heck is this?" I inquired. "I told Susan that I was going to do a year-long contact strategy test. Since I decide who gets every catalog mailing and e-mail campaign, I randomly sampled customers and assigned them to four different test groups. One I treated "as-is", one I held out all e-mail campaigns, one I held out all catalog campaigns, and here's the best part ... one group got nothing, NOTHING, for an entire year! Susan told me to not tell anybody or I'd get fired. Funny how you can get fired for advancing the craft of database marketing, don't you think?" I asked Mr. Feldman what he learned from the test. "What didn't I learn? First of all, demand is fluid. If you don't mail catalogs, customers begin to embrace e-mail campaigns. If you don't send e-mail campaigns, customers embrace the website even more. If you stop doing direct marketing, your search and affiliate and banner marketing activities are starved. And best of all, if you don't do any direct marketing, customers still spend some money. In this case, about half of the demand still happens. Half!!!" I inform Mr. Feldman that I call this metric the "Organic Percentage", and that this percentage is the most important percentage to measure. 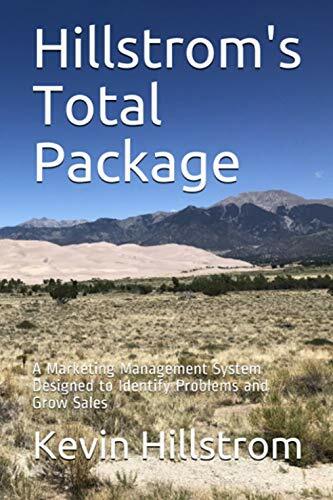 I describe to Mr. Feldman that many marketers believe that marketing is the reason customers purchase merchandise, especially among catalog marketers. Once you realize that half of the demand happens anyway, then you attack the half that is driven by marketing. This usually means that you can reduce mailings to customers without losing significant amounts of demand, and, you can end up being a lot more profitable in the process." Mr. Feldman smiled, then looked at the report, and responded. "Take a look at the e-mail only segment. 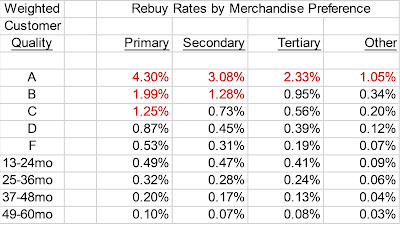 Those customers were actually the most profitable, even though they spent a lot less than the catalog segments. The most profitable test cell suggests that this company could discontinue catalog marketing altogether, and be more profitable. That sure wouldn't go over well here!" 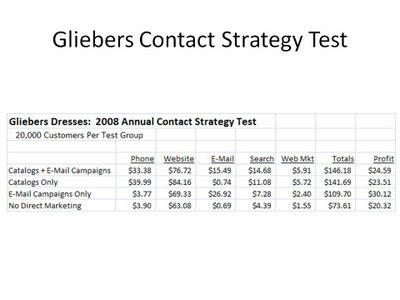 Of course, the most profitable answer is to test the right combination of catalogs and e-mail campaigns. Something between 0 and 24 catalogs will be most profitable. After looking at the data, I realized that the lion's share of the twelve-month housefile had to be included in this test. "Yes it was!. And guess what? We were more profitable as a company because I did this test. We'd never have done an e-mail only group, and that group generated enough additional profit to offset the two test groups that lost money." I asked Mr. Feldman if he shared the results with Susan Wheldon, his boss? "Yes. She said my work was excellent. But she told me that Glieber and Thompson would never sign-off on the results. Old man Glieber doesn't want to do anything that reduces demand. Ms. Thompson doesn't want to do anything that reduces the reach of her product." I asked Mr. Feldman why he was wearing a bow tie. "I wear one every day. When I was asking to have the proper analytical hardware and software brought into the company, Roger Morgan (who runs Information Technology and Operations) told me that I was just a closet geek who secretly wanted to work in the Information Technology department. He laughed, I didn't. 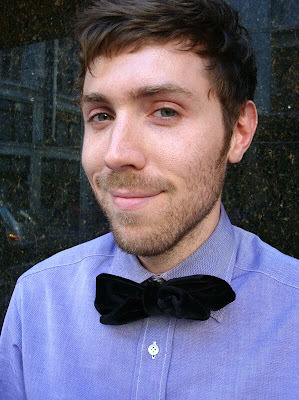 If that's the way the company wants to portray me, then fine, I'll wear a bow tie. It's my signature, my way of quietly protesting the computing environment at Gliebers Dresses." Every company seems to have an enterprising individual, somebody who doesn't accept established rules. And from time to time, this individual uncovers a secret. Boris Feldman has one of the answers to increased profit at Gliebers Dresses. You better believe that I asked Mr. Feldman for a copy of the transactional data that fueled the test results! Where'd you get my HS photo from? Seriously, great observation--while about 90% of people come to work to get a paycheck and whine about long projects or taking calls past 5pm, there are a small but significant number of people who love their work. You can see in your example that people that are constantly ignored get bitter---sounds like Mr. Bow-Tie is about ready to make a career move--probably to the competitor Anna Carter. I've seen similar situations. You had a post awhile back, not the data analyst celebration but another about how you build a multichannel forensic team and what you look for in people you hire(and fire, thank you Mr. Trump). I couldn't find it again--do you know which I am talking about? Great series. I barely remember that post ... this post is #1,301, if you can believe that.